They did not open the West--muzzleloaders did that--but they did tame it. To this day, the uniquely American lever gun thrives. Recently, a Marlin Model 336 Cowboy .38-55 rifle came my way. My shooting partner, Ron Cox, and I took the 24-inch-barrel rifle to the range to wring it out. Out of the box, open iron sights only, the first bullet from a cold bore cut a circle out of the upper left-hand corner of the aiming point. The next two created one figure-eight hole at the bottom of the one-inch square. Total group size at 50 yards ran 0.8 inch center to center. After chronographing several rounds, Ron, a former SWAT sniper, shot another group. This time three shots created one hole 0.266 inch center to center. We're in the process of mounting a 12X Leupold scope on the Marlin to satisfy curiosity about 100-yard accuracy. I have Mount McKinley confidence in this rifle's ability to put a bullet right where it belongs on game up to moose size. That bullet will weigh 240 to 300 grains, handloaded to double-century velocity. Cartridges for lever-actions bridge the waters with .22-caliber speed rockets on one side of the river to heavy-bullet bigbores on the other. For a while, Remington had the .30-30 Accelerator firing a .22-caliber bullet at about 3,000 fps. Marlin's .450 cartridge is the .458 American wildcat, a shortened .458 Winchester retaining the belt. It launches a 350-grain bullet with bear-stopping performance. The .444 Marlin is another powerhouse. Hornady offers a fine 300-grain bullet for the .444 pushed at 2,000 fps with 51 grains of H-335. The ancient .45-70 Government thrives in lever-actions. It's big-game formidable with bullets ranging from 300 to 500 grains. The .405 Winchester is back, and the .38-55 has a new lease on life, which it deserves. It shoots several bullets extremely well, such as Hornady's 220-grain HP-XTP and the Laser Cast hard-lead missile. Redding/Saeco has fine bullet moulds for the .38-55, including the standard 255-grain Round Nose Flat Point, but also a 225-grain to the left of it and a 300-grain to the right. Lyman also has superb bullet moulds for the .38-55. 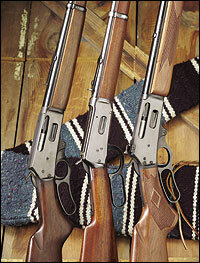 Current lever-action chamberings also include the .38-40, .44-40 and .45 Colt. The .357 Magnum/.38 Special (and .38 Special only) are offered, along with the .44 Remington Magnum. And of course the .30-30 cartridge continues to shine like a ruby in the sun. Finally, I had Clyde Ludwig's handsome hammer bolt replacement installed. This was a personal choice on my part. Mr. Ludwig does a fine job on this tiny fixture. The Marlin rifles worked for more than 100 years without an additional safety. As one writer put it, the second safety was a solution to a nonexistent problem. There are two major reasons for lever-action survival. The first is outstanding utility. Even at this late date in the evolution of hunting there are thousands who take to the field annually with iron-sighted .30-30s, confident that at the moment of truth when that whitetail buck breaks cover, venison will be theirs. Fixed with scopes, these lever-action rifles are even deadlier. The accuracy is there. The power is there. My own handloads for the refurbished Marlin Model 336A .30-30 rifle with 24-inch barrel include a 165-grain Swift bullet at 2,400 fps. These feed through the magazine, but I install only two rounds with any pointed bullet, never more. When one cartridge is chambered, there remains only one in the magazine with no bullet point up against the primer of a round in front of it. I also load 190-grain Silvertips extracted from .303 Savage ammo. These achieve 2,165 fps from the renewed Marlin burning Reloder 15 powder. Meanwhile, the 19th century .38-55 shooting Winchester's accurate 255-grain Soft Point Flat Nose bullet (also withdrawn from factory ammo for handloading) is entirely adequate for elk in the timber at 1,900 fps with H4198 or Reloder 7 powder.